We planned small updated, but as it happens, we tested it too long, and rewrote internal tools, particularly, update system. Now during update tracker is testing connections with our servers and selecting the one from which loads goes faster. Also, we improved the process itself, now you can easily close updates tubs, or open it from another device and update will continue as usual. There are not so many features, but all of them are useful. It takes too long to use scripts for domains test for ban, and from time to time it bothers arbitrageurs. Now tracker will let you know by itself that it is time to change domain names for more clean ones. In landings it looks like that. To make check work one need to indicate in settings your Google API Key. Where to find it, add it and all other questions answers are in documentation. Everyone are bored of old notes without “beauty”, and we added it a little bit. Now in notes you can use underlined bold italics, insert screenshots of your profit rates, motivating quotes of the great names of history and lunch shopping list (to not forget). 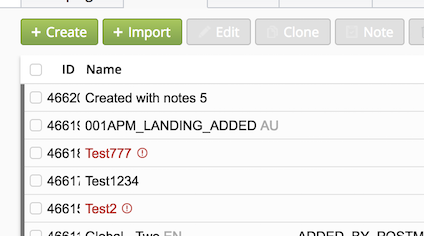 Also, by numerous request we added notes to the offers and landings editing window. What a pain to change tracking domains in 50 campaigns. And overall to change whatever. But it’s time for changes, we continue binom group work tradition. Batch changes are possible now almost for everything, besides, probably, distribution, but you can change rotation by campaign. It was asked for so very long, but we are so wicked, done nothing of it. Ready. For example, you can filter report by pubs report getting status with or without them. Like this. Before it always was sum… or average, I don’t remember Now you can set up what to show in total for each column. 1. Nothing. 2. Average. 3. Sum. Before it was just Smart Rotation, the thing dividing traffic to new for users paths, offers, landings. But some users needed absolutely the same but opposite; to fix a click on the same flow it came the first time. To do it we changed this option to Type of distribution. Inside of which there are 3 smart locations, 3 fixed and one random. The more distribution is flexible, the bigger is ROI. — System of triggers, notifications. Possibility by condition of any event in tracked to set up reaction, namely, distribution and domains changes, send notification or post back sending, script completion. The are lots of versions of use. Binom will be even more flexible and versatile.